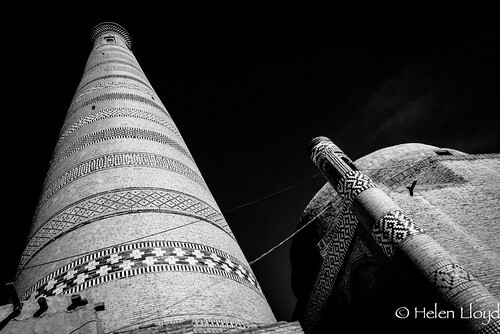 I pushed on towards Khiva, rather than camp – it would have been the crap kind of camping. Where you have to hide and make no noise and try not to be seen. 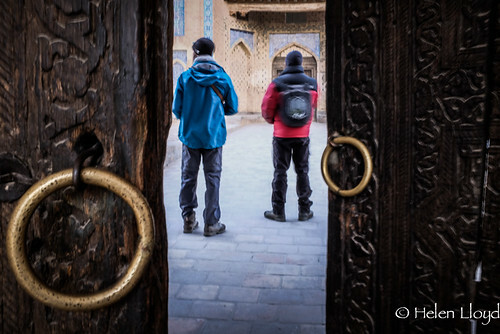 There were simply too many houses and people from the main road to Khiva. Nothing like the desert the day before. Besides, I thought I could beat the setting sun. Thought it would be great to arrive with the city walls bathed in a golden glow. So I pedalled hard and fast. I watched the sun set on Khiva while I was still several kilometres away down the straight road from Urgench. I arrived at dusk. Pushing my bike through the narrow alleys of the Ichon Qala, looking for a guesthouse that was still open now it’s out-of-season. The inner city was deserted. Just a few boys chasing each other – racing past, leaping off ledges and bounding up steps. Only footsteps, voices and shadows. And the stars above. I felt the cool breeze as one boy brushed past me. I’m going to like this place, I thought. I could tell. Sometimes, you just know these things. The guesthouse I ended up at was lovely. And there were other tourists there too.The paths of perennial travellers often cross. And recross. Antoine and Noam had to suffer me jabbering away; having not spoken English for over a week. I spent the next few days, lazily wandering through the city, taking photos, relaxing in the guesthouse, reading, chatting, sipping a beer. The days are short now and there has been a bitterly cold Siberian wind blasting that has everyone walking round with woolly hats on heads and hands thrust deep in pockets. Or staying indoors and drinking vodka. 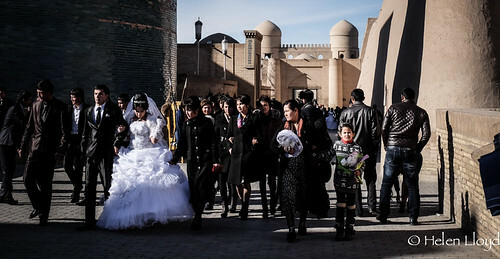 During the day, the streets are busy – multiple wedding groups arrive with trumpets blaring for photos in the iconic Ichon Qala, inside the inner walls of the old city. There’s no statue of Timur here though, or Chinggis. Instead there are huge chairs with plush red cushions and giant stuffed tiger cuddly toys to be photographed with. 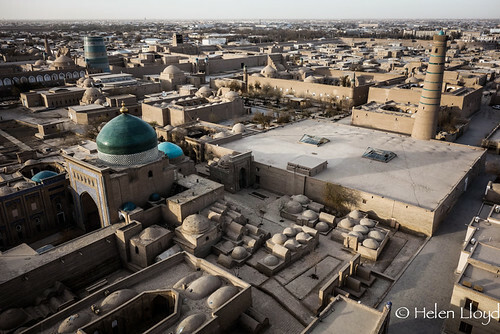 The Khanate of Khiva was ruled by the descendants of Chinggis. But in 1873, it became a Russian protectorate. Later a Soviet People’s Republic. Then incorporated in the Soviet Union. And finally split between Uzbekistan and Turkmenistan. Khiva the old city is on the Uzbek side. Clearly. So that’s the last of the great old Silk Road cities I’ll be seeing on this trip. Out of Samarkand, Bukhara and Khiva, this last is my favourite. That’s the advantage of travelling with a companion – camping near a village(Or even in it – http://poab.org/view/log/491/6#6) is not an issue, as you can share the hassle(if there is any). As always, it’s a pleasure to follow your progress through Central Asia.